The Haggada is our guidebook for Chinuch, with the passage of the Arba Banim holding a prominent place in its instructions for Mechanchim. The first of the four sons is the Chacham – we all know one or more like him. However few or many of these bright and eager children we have in our class, they are the ones we refer to when we talk about the “upper third”. The first thing an educator needs to know about the Chacham, is that he has a question – and maybe he is first in the sequence because otherwise, we might not even realize that he has one! The Haggada clearly communicates that even our most successful and capable students have something that they genuinely need from us educators, and that we need to challenge ourselves to meet their need. What is it that we can give a child who knows most of what we planned to teach before we teach it? Too often, this child is ignored – a lucky strike for the teacher who can now focus his attention on the rest of the class, or built up and complimented but basically regarded as a mini adult, someone who can fend for himself. While practically, we may need to prioritize the more immediate crises presented by struggling and rebellious students, there is still much that we could and should do to support, inspire and edify the “wise” among our students. With some skillful planning, we can organize our teaching in such a way that their needs can be met simultaneously with those of the other students in the classroom. Let’s look at what the Chacham is asking us for: “What are the eidos, the chukim, and the mishpatim that Hashem commanded?” There is a lot that this child already knows, such as the categories of the Mitzvos and sophisticated terminology. However, he craves discernment and subtlety. He needs to know more. We are enjoined to respond to his call. Intellectual stimulation is not a luxury, it is the need of every child at his or her level. Every student needs to be challenged – in terms of Maslow’s pyramid, they have a powerful need for self-actualization, or as per Piaget if you prefer, their disequilibrium needs resolution. There is even a term to describe “gifted at-risk” students, who are under stimulated and therefore disengaged. In Hayom Yom (16 Cheshvan), the Rebbe teaches us that the mind is never still, and needs positive and holy input to constantly process. Therefore, for the thinking child, everything we have said before is that much more vital. It is not a luxury, but a necessity, for him or her to be fully connected to Torah at full capacity. So we tell all – kihilchos haPesach. We teach this child the halachos of the Pesach Seder with their detailed nuances, all the way through Afikomen. In a classroom, differentiated instruction makes this possible. While not every student is up to the Chacham’s level of understanding, a teacher can assign independent learning for the student, or group of students, who is. 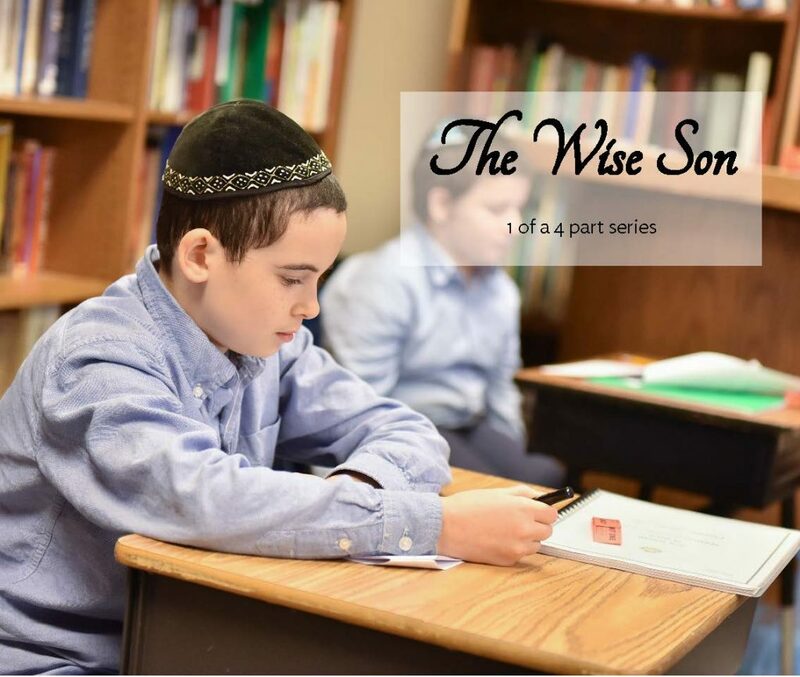 For example, more advanced students can research a particular commentary on the Haggada, or to learn Hilchos Pesach from inside Seforim while the rest of the class uses worksheets, whether individually or in groups. Of course, the more differentiation is built into the learning, with multiple tracks for different students, the more the benefit to the class as a whole. Chassidus gives us a deeper perspective into what we answer the Chacham’s question. The wise son’s mind is always at work; such a child strives to understand and make sense of everything they encounter. What they are really begging us for is the secret of the Afikomen. The Afikomen is an unadorned piece of Matzah, without even salt to spice it up, and represents our essential relationship with Hashem that is beyond the geshmak of intellect. We teach this child the Halacha that we don’t eat anything after the Afikomen – there is no other dessert. This is our geshmak! Using our intellect to reach the limits of intellect – to understand that we cannot understand – is the Avoda of Chassidus, and the climax of the Seder. This is what the Chassidim Harishonim, who had reached great heights in Nigleh and self-refinement, were so grateful for when they arrived at the discovery of Chassidus. Without it, they were stuck within the limits of their own, albeit superior, understanding. Similarly, for the wise child, things may seem to come easy. Academic success can be easy to attain; good behavior is perhaps not such a challenge. As the child grows more mature and introspective, this reality can become limiting as he searches for a sense of purpose, and wonders whether all of the compliments and accolades heaped on him by teachers and other adults are really deserved. By guiding him in the derech of Chassidus – as it is expressed in the message of the Afikomen – we are giving this child the greatest gift of all. We are giving him something to strive for. In many letters and Sichos , the Rebbe encouraged us to teach Chassidus to even the smallest child, each on his or her own level. In the Hagada, this is something the Chacham may be practically begging for, and is still seeking, in his or her own way. Another lesson in juxtaposing the Chacham and Rasha is that they might have a thing or two in common, as much as it might seem otherwise. An intelligent yet under-stimulated child might turn to other sources to satisfy his curiosity and innate need for engagement. Unfortunately, we see this to be true on occasion when particularly bright students, who for whatever reason have not find an outlet for their curiosity or creative minds in their Limudei Kodesh classrooms, end up finding academic and personal fulfillment in other pastures. Of course the situation should not be oversimplified, but the challenge to us educators remains to provide answers to the Chacham’s questions. So let’s not leave our bright students to have their hands up in the air for so long that they stop raising them. Let’s strive to meet them on their level and actualize their potential – through rigor in learning, the light of Chassidus, and the power to give. For example, in the Sicha of 9 Elul 5718, Toras Menachem Vol. 23. For example, in Igros Kodesh Vol. 19, letter 7372. תו”א ד”ה שמים כסאי, and often quoted in the Rebbe’s letters.